Cornelis Ketel was an important 16th-century painter who worked within the so-called Dutch Mannerist style, and was most celebrated for his portraits. Ketel travelled to France and England where he met Federico Zuccaro, whose style profoundly influenced his later output. Ketel finally settled in Amsterdam, where he remained for the rest of his life. He specialised in group portraits while also producing allegorical and narrative compositions. This pair of portraits depicts a man and a woman, painted half-length and seated. Their heads are turned slightly towards the viewer, whom they engage with an intense gaze. Their bodies fill almost the entire pictorial space, blending in with the dark background. The only elements to stand out are the faces, ruffs and hands; the man holds a handkerchief and the woman a book. The female figure has been related to a drawing in the Rijksprentenkabinett, Amsterdam. Among the various genres in which he worked throughout his career, Cornelis Ketel was most noted for his portraits in which he modernised traditional formats and thus laid the way for the great innovators of the following century such as Thomas Keyser and Frans Hals. Ketel trained with an uncle and later with Anthonie Blocklandt in Delft. He spent time in France and later in England, with a period of seven years in Gouda between the two trips. 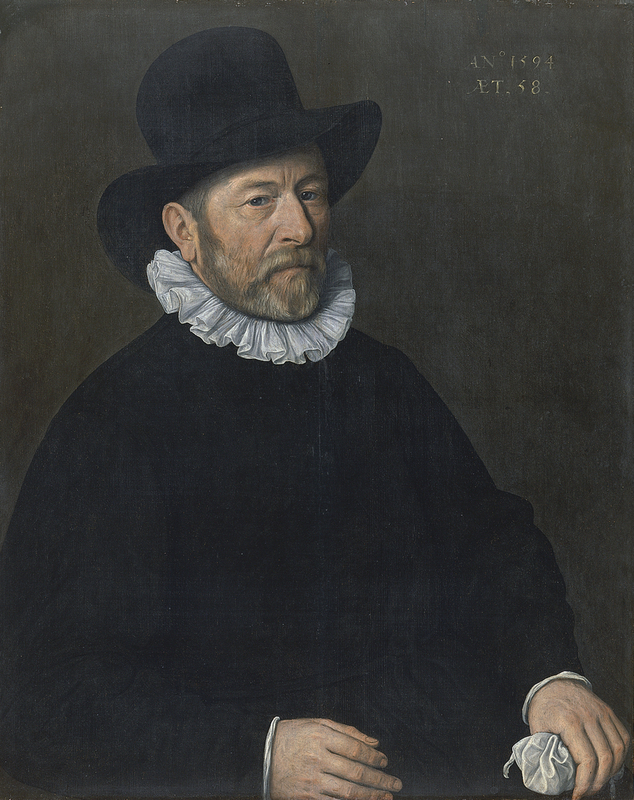 On his return from London in 1581, where he had worked as a portraitist, he moved to Amsterdam. The present pair of portraits dates from that period. These two sitters, whose names remain unknown, may be a married couple from Amsterdam. Both panels have the date of execution, 1594, and the ages of the sitters, which is the only information supplied by the artist on his clients. The two panels were formerly in the Taco Mesdag van Calcar collection in The Hague, then in 1928 with the Amsterdam dealer Jacques Goudstikker, who included them in an exhibition that he organized in Amsterdam that year. Shortly afterwards they were acquired for the Thyssen-Bornemisza collection and appear in its catalogues from 1930 onwards. In these panels Ketel represented the two sitters seated and half-length against very dark backgrounds. Their faces are turned towards the front and they look directly at the viewer, conforming to a model developed by the artist in the 1590s when he experimented with different poses and the arrangements of bodies, making maximum use of the forms to fill all the pictorial space. During this period Ketel’s figures became more solid and realistic, moving away from Mannerist ideas evident in his earlier work. In the present panels the artist paid particular attention to the faces and hands. The man holds a handkerchief while the woman holds a small volume, possibly a prayer-book, with her finger holding open one of the pages to remind her where she had paused in her reading. Ketel not only recorded his sitters’ physical appearances, but was also able to convey their characters and personalities. The female figure has been related to a drawing in the Rijksprentenkabinet in Amsterdam of a seated woman in which the pose and folds of the dress are effectively rendered. It has been thought that Ketel may have used drawings of this type to reduce the number of sittings required from his clients.